Many people have a love/hate relationship with grocery shopping. They love having food in the house, yet the whole process of going to the grocery store can be daunting. Couple that with restrictions on what you can and cannot eat, most would rather visit the dentist for a root canal. 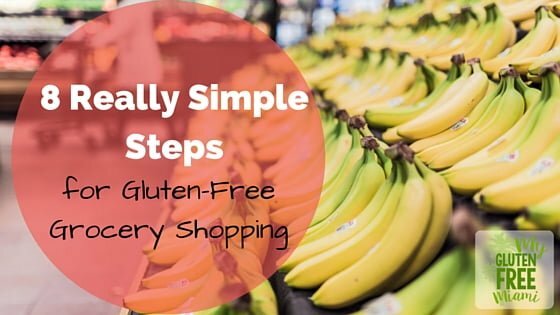 Gluten-Free Grocery Shopping doesn’t have to be hard. Normally, I am a person who LOVES grocery shopping. Yes, it is weird, but I do. When we visit new cities, one of my favorite things to do is check out the market. It is amazing the differences in food based on the area you are in. But I remember those first few times I went grocery shopping after going gluten-free. I was confused. I felt lost. I cried (I seem to do that quite a bit). No one was there to hold my hand, and honestly the information I had received from the nutritionist at my GI Doctors office didn’t really help much. After the tears subsided, I proceeded to buy anything that said gluten-free. I had not clue what I was buying and spent a fortune in the process. Since those days the process of buying groceries has become much simpler, no longer are there tears, but normal, fun (at least for me) shopping trips. As I think through what has made the experience easier, I have come up with 8 tips to help anyone who is going gluten-free. (1) Shop the outer perimeter of the store. Good news! Meat, Produce and the majority of dairy items are gluten-free! The majority of grocery stores place these items around the perimeter. It is still always wise to read the label, but my staying in these areas you will find that you will also eat healthier. Go in with a plan. Have an idea of what you want to eat. This will prevent you from randomly picking out items, reading a label, and then getting frustrated when you cannot eat it. If you have trouble with making meal plans, you may want to try Plan to Eat. It is an online meal planning tool. It is pretty simple to use and you can try it free for 30 days without having to enter a credit card number (which is awesome, I hate “free trials” that automatically charge you…it’s a pet peeve of mine). Always read the label. Product ingredients change. When you first read the label, start with the allergy warning. Most products will say,”May Contain: WHEAT or DAIRY or SOY” or some variation of this. If it contains wheat, put it back. Unfortunately, wheat is not the only source of gluten, so you will need to check the label for other hidden sources. I have made a great cheat sheet that you can download and save to your phone as reference. If you would like a copy, just enter your info and it will be sent right to you! (4) Lean towards products that are certified gluten-free. If it says it is certified gluten-free you will have less of a chance of any kind of cross-contamination. (5) Google is your friend! When all else fails, pull out your phone and google the product! If you are purchasing items such as sliced deli meat and it is not easy to read the label, just ask. As a side note, when purchasing deli meat, also be sure that they use a clean slicer. While some meats are gluten-free, not all are and you do not want to risk cross-contamination. (7) Go with a friend. Do you have a friend who is gluten-free? Ask them to accompany you and point out there favorite products. Plus, they can hold you if you do start to cry. Those first few trips can be tough ones. I buy quite a few things online. My absolute FAVORITE gluten-free flour, Jules, I buy online. We often purchase things like crackers, or even cookies and pasta from Amazon. If you cannot find what you are looking for in the store. Chances are you can buy it online. The internet is wonderful for finding new gluten-free treats! *This post contains some affiliate links. Using them supports this website. No product will ever be recommended that is not personally used and loved. It was, but has definitely gotten easier over time! That’s awesome! I will check it out!